Hawai’i’s Department of Land and Natural Resources documentary highlights the efforts to restore Lehua Island to a seabird safe haven. Narrator: Unless you know better, you might not guess Lehua Island is in Hawai’i. It’s a stunning island, rising more than 700 feet out of the sea. It has fascinating geology; vertical cliffs, an arch in the making, and tidal pools and shelves. It’s typically windswept and dry and seen from the west side of Kaua’i, you’d think it’s lacking life. It is a noisy, vibrant, active island. Nesting and fledging ground for thousands of seabirds. Some that are in serious trouble as continued members of our planet’s wildlife roster. Until just now, another wild animal, brought here by man, menaced them. Mele Khalsa: Yeah, so these rats have been here for quite a while and their impacts are very well documented. We have documentation of them eating the chicks, the eggs, of you know all the baby birds of multiple different species. We don’t know exactly when they arrived. The first survey of Lehua was done in the 1930’s. At that time they were documented on the island. We have 17 different species of birds out here and many of them are impacted by the rats. 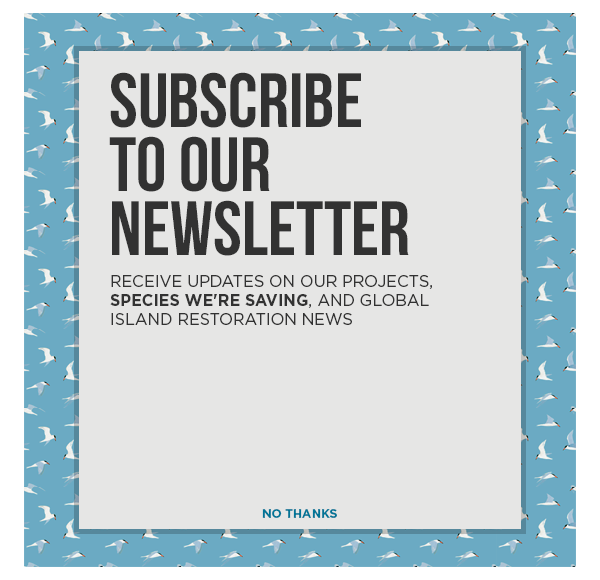 They also eat the native plants and the seeds of the native plants, and that has been challenging for the restoration potential of the island. Yeah, it’s great, you see them all around parking lots and stuff around fairly often. They are an attractive tree, it does pretty well out here, but a lot of these seeds get chewed up and eaten. Sabra Kauka: As a cultural practitioner it’s very important to me that these birds, that we keep them alive as long as possible. To me they are, they are so important, they are so important to our culture. We hold birds in very high regards. Birds can do things that we can’t do and they say immediately, they can fly? I said sometimes yes I think I’d like to come back as a bird. I’d like to fly like they do, I think? Maybe in the past I might have been one, but they can fly, they can search for fish. They can spot the fish. They can tell us that those fish are there and to this day, our fishermen follow the birds to see where the schools of fish are. So birds, in Hawaiian culture are extremely important. Narrator: This is why a large group of government agencies, world-renowned conservation groups, numerous native Hawaiian organizations and individuals, the owners of nearby Niihau and many others joined in the Lehua Restoration Project steering committee. Sheri Mann: So, I hope that people believe that we did do our homework, that we did a lot of research, we followed best management practices that were very tried and true; bringing in the world’s experts with Island Conservation. Narrator: Sheri Mann, branch manager for the state’s division of Forestry and Wildlife on Kauai, was one of two incident commanders during the mid-2017 drop of poison-laden pellets on Lehua Island intended to rid its slopes of invasive Pacific Rats once and for all. She discusses the enormous collaboration that led to the plan, the permits and the execution of three aerial applications of rodenticide in late August and early September. Sheri Mann: We had a suite of partners, including the Fish and Wildlife Service, USDA, we had the Island; the owners of Niihau and we had multiple divisions within the Department Of Land and Natural Resources. We had the National Tropical Botanical Garden and others. So this was a very collaborative, well thought out project. We put a lot of time, over a year, before we actually deployed the product. Narrator: Flashback to 2009, the first try at getting rats off the lehua island. An altogether different project, than the recent one, also attempted to eradicate the predators. Poison did take care of a lot of them, but some survived and repopulated the island. Keith Robinson: The first rat poison drop back in 2009 was an absolute disaster. It just, it just wasn’t done right. Patty Baiao: Ah, the other thing is that I want to reinforce are rules. Narrator: The team hired by the state to lead the 2017 Lehua Eradication Project is Island Conservation. Patty Baiao: If you want to be in, you have to ask for permission, and you have to get permission from Tommy. Narrator: They’ve done this kind of work on dozens of islands around the world, with a very successful track record. Keith Robinson: When we found out that there was going to be another rat poison drop, I suggested to my brother; the first one we were not involved with, and they had to carry everything from Kauai without staging on Niihau. The second time around we better get involved and see if we can steer this thing in a saner direction the second time around. So we got involved and made some suggestions. This is a different outfit doing this work than the first outfit was that made the first drop. This outfit listened to us and made three basic changes that we considered important. One, it dropped in the summer, instead of winter when the rats, when everything is dry and the rats are stressed for food. Second, they did not drop in front of; just ahead of the biggest storm, rainstorm in the winter. Third, they did not drop in a high wind; all of which were three mistakes made on the first drop. Narrator: The people of Niihau, since their island is less than a mile across the channel from lehua island, perhaps have the largest stake in what happens. Not only were they extremely supportive of the 2017 project, island owners Keith and Bruce Robinson allowed Niihau to be used as the command post for the aerial spreading of bait. A team of Niihauans were hired and trained to handle the bait and get it into the chopper’s hopper. Keith Robinson: There were originally both rabbits and rats in Lehua. The rats, ah the rabbits were evolving into some kind of a super breed. The rabbits appeared to not only be able to eat the vegetation, but they were also developing a specialized claw, big claws, for digging burrows in soft volcanic dirt. They also appeared to be adapting to eating seabird eggs for moisture in a drought. Once those rabbits were eradicated, which occurred successfully prior to 2009, the seabird population increased so much that about two years ago, my brother had to give the orders to our Niihau helicopter to stay away from Lehua Island due to the possibility of bird strikes, which are very, very dangerous to a helicopter. So, already the poisoning of the rabbits appears to have an effect on the bird population increasing. What will happen as a result of this? I don’t know? But I would not be surprised at all if the bird population takes a big jump after this. Narrator: That’s the goal. Coming up next, the well planned, well choreographed, highly regulated aerial applications, as “Lehua Island, Restoration of a Tropical Bird Paradise” continues. Narrator: Restoring Lehua Island to its natural state as a tropical bird paradise is a tall order, because of these tiny voracious rats. Patty Baiao: We have to get them all and the reason why we have to get them all is they are very prolific little creatures. So if we leave as much as one pregnant female, they have a very good ability to just bounce right back and repopulate the island. Narrator: That’s why years of planning went into the 2017 aerial application of a rodenticide laced bait aimed at clearing rats from lehua, permanently and totally. Patty Baiao: We understand that projects like this have inherent risks. So we very much respect the public concern over risks and we acknowledge that there is some risk that we are trying to minimize as much as we can with how we proceed with the operation and how we work our strategy to achieve the end goal. Narrator: Two years ago, the partners of the Lehua Island Restoration steering committee conducted a trial drop of bait. Josh Atwood: So today is kind of a trial run. This is a chance for us to fly some helicopters out to Lehua Island and we are dropping a non-toxic bait onto the island. It’s these same formulation that you would use in a rodent control project, except it doesn’t mix at all. It’s just cereal basically and a little bit of dye which lets us track where the bait is going on the island. Narrator: Test plots helped the team understand how to safely spread the rat bait and try and minimize any unintended impacts to land and sea creatures besides the rats. Over the course of many months, steering committee leaders held public meetings to explain their plans, answered dozens of media inquiries and tried to dispell misinformation that often spread across social media. Hob Osterlund: You hear 10 tons of poison being dropped on this little island; it sounds horrible. You feel like the whole place is going to be covered with Roundup and be forever killed and so what I like to say, is that using that, using this particular rodenticide as we call it or rat killer…it’s using a blood thinner. It’s using a drug that is very much like, Coumadin, the drug that people take for eliminating or preventing blood clots. Millions of people take Coumadin. So, it isn’t about the actual chemical itself being poisonous, it’s about the fact that rats are particularly susceptible to it. They’re particularly sensitive to this chemical called diphacinone. So, I brought this just to show you. So also what is being dropped, the 10 tons of cereal grain that is being dropped, includes about this much, this weight, this much of the diphacinone, or the blood thinner. Narrator: Hob Osterlund is the founder of the Kauai Albatross Network and a conservation author who notes how quickly false information spread across the garden island. Hob Osterlund: Then all of those details get lost in the conversation. Because shouting matches you don’t get to actually find key details like that. But a steering committee met, looked at all the possibilities. Applied for all the correct permits. This is not anybody doing an end run around the environmental protection laws. This is, this is actually the most proven way of doing this. There isn’t a better way to do it. Narrator: Lehua is a high island, which means it probably won’t be impacted by rising seas. Michael Demotta: I tend to look at it from a long term perspective. I think we need to worry about losing some of the northwest Hawaiian Islands and the birds, and snails, and other organisms that are endemic to those areas and thrive out there. When the ocean levels if they continue to rise, those islands will be lost. We have to work on it now. We have to turn Lehua into a functioning native ecosystem to provide a sanctuary for the birds and the other animals that are up in the Northwest Hawaiian Islands that really don’t have nowhere else to go. Narrator: August 22nd, one day before the first scheduled drop of the bait containing tiny amounts of rodenticide. It’ll be a busy day for the Lehua Island restoration team, who’ve been camping here off and on for weeks to prepare. Under a tent to protect them from the unrelenting sun, they put tiny radio tracking collars on two dozen rats they’d trapped earlier. Mele Khalsa: Adult male, 36 grams. Narrator: Then off to the field, where the collared rats are released in the exact spots where they were trapped. Mele Khalsa: We are releasing these radio-collared rats in order to track them across the island, and to see how they respond. How quickly they respond to the toxic bait pellets. Narrator: Under the watchful eyes of adult Red-footed Boobies, their chicks, and juveniles, each rat scurries into the grass. Hob Osterlund: There are people who are opposed to this, who would also love to see it fail. There are people who would love to say, see I told you, it failed and that can happen, just by a rat or two being left in this whole controversy. So to me the people that are interested in protecting our Hawaiian native critters want this to succeed. Narrator: And to a person the dozens of people who’ve worked hour after hour, day after day, often for years at a time preparing for what’s about to happen. One hour before sunrise on August 23rd. The team on Lehua Island begins making hourly weather observations. The choppers won’t fly and won’t drop bait if the winds are too strong or if rain is forecast. Narrator: A sign goes up to alert boaters that helicopters will be flying bait buckets across the channel. The coast guard has already issued a mariners alert. Everything needs to go perfectly, just as planned, in order to achieve the end goal, which bears repeating. Andre Raine: We really do understand the fear factor. It doesn’t sound like a nice thing to drop, people were talking tons of bait. It wasn’t actually tons, it wasn’t tons of poison and it was tons of bait, so there is a genuine fear but unfortunately, there is a lot of misinformation out there and that just amplified the fear. If people understood the facts, firstly, the threat; because most people don’t come out here. We’re fortunate enough to be out here watching that wedge-tailed chick flapping its wings. You know, people don’t come here, so they don’t know what the island is like. Communicating by radio between Lehua and Niihau, where the bait is loaded, the first chopper gets a green light. Criss-crossing Lehua, in roughly parallel lines, the plan is to spread enough of the pencil-eraser sized bait over as much ground as possible to ensure 100% exposure. Staff: So are these guy, who are these guys again? Mele Khalsa: Division of Aquatic Resources. Narrator: Agency and independent monitors are on boats watching for any potential impacts to aquatic life. On the shore the restoration team continues hourly weather checks that helps serve as eyes and ears for incident commanders over on Niihau. Mele Khalsa: It’s really exciting to see it finally all coming together. It’s been many years of planning, and it’s been a long road to get here. It has been quite a rollercoaster ride with a lot of challenges along the way. But it’s good to see this happening and the restoration of the island has really begun. Narrator: It’ll be a year before anyone can say with complete certainty that lehua island is rat free. 19 days later, on Sept. 12th, a helicopter sweeps in over Niihau, ferrying team members in for the third and final bait drop. They’re greeted by Keith Robinson, who as you heard earlier, did a 180 in his thinking between the failed 2009 attempt and this one. Keith Robinson: It was very, very thorough planning. Originally I had jumped to the conclusion after the 2009 bait drop, that it was a sloppy bait drop and that it was the poison that caused the fish kill. But I had to revise my opinion after I did a lot of in depth studying. Patty Baiao: We are here to do our third and last drop on Lehua and I’m very excited that we are on the last run here. So I just want to make sure to touch base on a few things that very important. What you need is long pants, long sleeve shirts, shoes, socks. We have an in-depth operational plan that we follow very closely. We have an incident command structure as you pointed out. So, we have very clear hierarchy of in roles that every single person play and they know those roles and they understand the roles that they play. So, there is very careful planning and implementation of the operation that follows a number of requirements on a number of permits that are required for us to perform this operation. Narrator: On this last day there’s praise for the exactitude and professionalism of the entire operation and particularly for the residents of Niihau who were hired and trained to be part of the operations team. Handling the bait bags, pouring them into the hopper and making sure, time-after-time that each load gets safely off the ground and onto Lehua. Rob Scherzinger: I was telling you guys this is um…i’ve done lots of these islands and this is the cleanest loading station I’ve ever seen. I have not seen one drop of bait that has hit the ground and that is a real compliment to you guys because there is a lot of going on; the wind and there’s just a lot of chaos. Patty Baiao: What guides us for every project that we work on, what we look at is if the long-term benefit outweighs those risks. There is always risks with everything that we do. Based on the best available science that we are aware of and that we have worked from, we believe that if there is any potential short-term risk, they are by far outweighed by the potential benefits to the seabird colony. Lehua is a very important seabird colony in the Hawaiian Islands. Narrator: We again visit Lehua Island two weeks after the final drop. Coming up, are the rats gone and what’s ahead for Lehua Island Restoration of a Tropical Bird Paradise? Andre Raine: There is a little Wedge-tail condo here. Narrator: More than ever, Lehua Island is going to the birds and possibly not to the degree seen since rats somehow got to this deceptively barren looking island decades ago. During recent efforts to rid Lehua of rats and to restore its place in conservation as a tropical bird paradise, dean foster of the United States Department of Agriculture’s National Wildlife Research Center spent days here. He was one of the independent observers, required by permit to be here to watch for and report back on, any negative impacts to what project planners called; non-target species. In other words marine mammals, fish, any creatures other than the rats. Dean Foster: In that role we are looking at the entire operation and looking to make sure their targets on baiting and also to monitor the environment for any residue from the bait. It’s actually quite impressive, because in the evenings and also in the mornings you would see rats crawling around all over the place. And since the first day of the first drop, there’s just no more rats and there are so many birds now. Just imagine how many more birds is just going to be after, once all the rats are gone? Narrator: 17 different seabird species already nest on Lehua. If the rats are indeed gone, it’s expected other birds that once nested and raised their chicks here will return and add to the remarkable pallet of life possible on this remote, protected island. Hob Osterlund: My hope for Lehua is that some of these native birds have a safe place. Safe places are so hard for seabirds to come by. Any native birds; the water birds have an equally bad problem, but the seabirds have nowhere they can go. We are talking about albatross. We’re talking about petrels. We’re talking about Boobies. All these kinds of birds, have nowhere to go unless we protect them from the predators that we brought. So, that means, rats, dogs, and cats basically pigs as well. So Lehua has only one of those predators and that’s rats. We want to get rid of them so that those birds can nest there and successfully raise their babies and have a safe place away from the evils that we brought to them. Andre Raine: I’ve got a Wedge-tail here. Narrator: Two weeks after the conclusion of three aerial drops of pellets containing minute amounts of rodenticide, a team from the Kauai Endangered Seabird Recovery Project is here to check their plots. Andre Raine: And what we have a series of seabirds plots on the island. They are spread across the island. There is 75 seabird plots in total. Every single point is randomly situation on the island. What we do is we count all the seabirds within the plot itself. Now that we’ve had the rat eradication project underway, it will be really interesting to see how the birds respond to the fact that there is no rats here. Narrator: For five years now, Dr. Andre Raine and his crew have conducted regular counts of birds on Lehua. They are among the many experts who believe that the rats gone the seabird colony will grow and thrive. Tracy Anderson: I’m not one for spreading poison willy-nilly. But this is a time when it was an appropriate use of that. I’m looking forward to a time when this is back up to breeding capacity to see the birds in their numbers. Narrator: No rats, more plants, a restored tropical bird paradise. Michael Demotta: When the aina part of Lehua is restored there will be less erosion, the plants will hold the soil down. It will create ecosystems for other organisms like native insects and such. And then, of course, the birds will be a major benefactor to all that. Narrator: Everything up to this point is for the birds. Lehua Island is a prime example of the possibility of an uninterrupted circle of life and what a place like this can tell us; we who are ultimately responsible for what happens, good and bad, on the planet we share with so many other creatures. Andre Raine: These birds have been here long before humans have. This is their rightful home. So we have a duty of care to make sure that they are here and the numbers they should be in and protect them. Narrator: With continued luck, care and stewardship, Lehua Island, now on its way to become a true tropical bird paradise. Michael Demotta: It needs to be restored. We as human took the rats over there, we as human took the rabbits over there, and no one here today is to blame for the disruption and all that, those animals have done. But, I personally take it as a kuleana; responsibility of my own.